ABC: A few days ago you prompted the faithful to receive Holy Communion kneeling. Does the Church by reforming the liturgy in this way come closer to man? Cardinal Cañizares: Communion kneeling signifies respect for God, it is the heart of man which prostrates itself before the One Who loves him unto the end. These are signs, it is not about change for change's sake, it is about looking for the whole meaning and overcoming the secularisation of our world. One of the objectives of our congregations is to realise in these years a great campaign of liturgical formation. 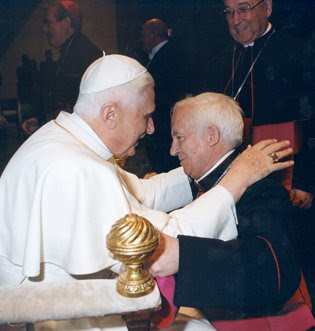 Speaking of Cardinal Cañizares, just a brief reminder that as mentioned in February, tomorrow His Eminence will pontificate in the Extraordinary Form in the Lateran Basilica. The NLM will try to provide you some images as soon as possible.